> Convocation ceremony will be held on Mangsir 27, 2070 BS ( December 12, 2013; Venue: Kathmandu University, Kavre) for School of Arts, School of Education, School of Engineering, School of Management and School of Science. 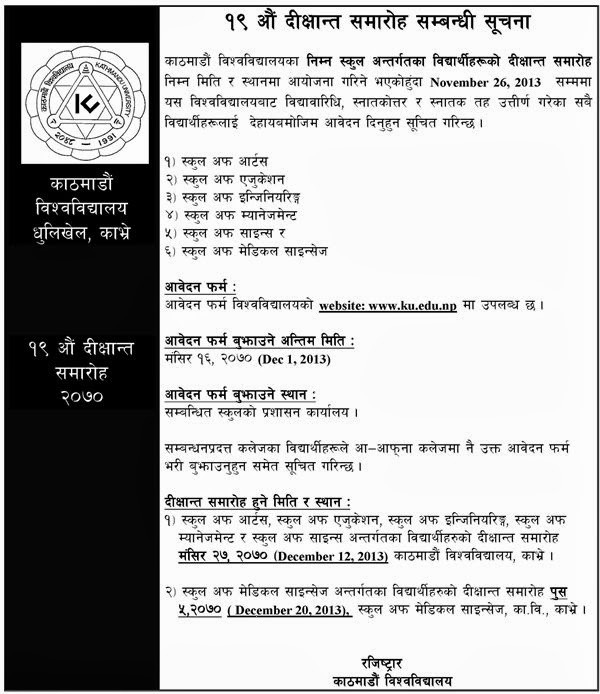 > Convocation ceremony will be held on Poush 5, 2070 BS (December 20, 2013;Venue: School of Medical Sciences, Kathmandu University, Kavre) for School of Medical sciences. Form for School of Medical Science (Download from link Below).